The National Football League playoffs for the 2015 season began on January 9, 2016. 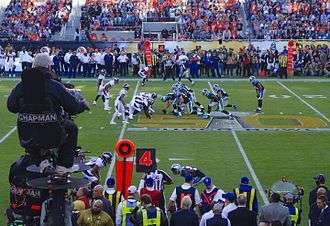 The postseason tournament concluded with Super Bowl 50, on February 7, when the Denver Broncos defeated the Carolina Panthers at Levi's Stadium in Santa Clara, California. For this year only, the Super Bowl decided not to use a Roman numeral ("L") and instead used the standard numeral "50". According to Jaime Weston, the league's vice president of brand and creative, the primary reason was that the league's graphic designers had difficulty designing a suitable, aesthetically pleasing logo with only the Roman numeral "L". All playoff games will air on network television. This was the NFL's standard policy through the end of the previous TV contract in 2013. After airing one game exclusively on cable on ESPN in 2014, the lone game which The Walt Disney Company owns the rights to will be broadcast on both ESPN and ABC, a broadcast network with a much larger audience. From Disney's purchase of ESPN and ABC in 1996 through 2005, ABC had aired all of Disney's playoff games (the network also aired Monday Night Football at the time). The last such broadcast was Super Bowl XL after the 2005 season. Disney did not own any playoff rights from 2006 through 2013. ABC and ESPN simulcast one AFC Wild Card game, while CBS will broadcast the rest of the AFC playoff games. Coverage of the NFC Wild Card and Divisional rounds will be split between NBC and Fox, with each network having coverage of one game in each of those two rounds. Fox will then have exclusive coverage of the NFC Championship game. Super Bowl 50 will be simulcast on CBS and ESPN Deportes. For the first time in NFL history, all four playoff games on wild card weekend were won by the visiting teams. It also marked the first time in NFL history that all of the wild card teams advanced past the first round of the playoffs. KC – Knile Davis 106-yard kickoff return (Cairo Santos kick), 14:49. Chiefs 7–0. KC – Cairo Santos 49-yard field goal, 12:50. Chiefs 10–0. Drive: 5 plays, 27 yards, 2:30. KC – Cairo Santos 49-yard field goal, 7:06. Chiefs 13–0. Drive: 6 plays, 40 yards, 3:29. KC – Chris Conley 9-yard pass from Alex Smith (Cairo Santos kick), 4:35. Chiefs 20–0. Drive: 11 plays, 94 yards, 5:23. KC – Spencer Ware 5-yard run (Cairo Santos kick), 14:56. Chiefs 27–0. Drive: 8 plays, 71 yards, 4:13. KC – Cairo Santos 33-yard field goal, 3:59. Chiefs 30–0. Drive: 4 plays, 6 yards, 2:13. Kansas City, who started the season 1–5 before winning their next 10 games, forced five turnovers and held the Texans to 226 total yards as they earned their first postseason win since the 1993 season (a game also played at Houston, against the Oilers), and the first shutout victory in an NFL playoff game in 10 years. It is the first (and to date only) time the Texans have been shut out at home. Chiefs running back Knile Davis gave his team a 7–0 lead just 11 seconds into the game by returning the opening kickoff 106 yards for a touchdown, making him the first player to score a touchdown on the first kickoff of an NFL postseason. The two teams went on to exchange punts, and then interceptions, as Texans quarterback Brian Hoyer was picked off by Eric Berry and Alex Smith returned the favor with a pass that bounced out of the hands of Jeremy Maclin and was intercepted by linebacker Brian Cushing. Houston then drove to the Chiefs' 30-yard line, but on 3rd-and-7, Hoyer lost a fumble while being sacked by Allen Bailey, and defensive tackle Dontari Poe recovered it on the Chiefs' 42-yard line. Kansas City subsequently drove 27 yards, including an 18-yard catch by tight end Travis Kelce, to go up 10–0 on a 49-yard Cairo Santos field goal. On the Chiefs' next possession, Kelce caught a 25-yard pass on a 40-yard drive that ended on another 49-yard field goal by Santos, making the score 13–0. Houston took the ball back and drove to the Kansas City 3-yard line, but linebacker Josh Mauga's interception kept them off the scoreboard going into halftime. Houston started the second half with a drive to the Chiefs' 40-yard line, but ended up punting. Shane Lechler managed to pin Kansas City back on their own 6-yard line with a 34-yard punt. But despite two holding penalties against the Chiefs, one of which nullified a 64-yard scramble by Smith, they still drove 94 yards in 11 plays for their first touchdown. Maclin was a key part of the drive, catching two passes for 23 yards, though on the second one he suffered a game-ending injury; Smith also completed a 16-yard pass to Kelce and finished the drive with a 9-yard touchdown pass to rookie receiver Chris Conley, give the Chiefs a 20–0 lead. On their next drive, the Texans had to punt after three plays, and then saw Kansas City drive 71 yards in eight plays, featuring a 48-yard reception by Kelce, to score on 5-yard touchdown run by Spencer Ware. Houston managed to respond with a drive to the Chiefs' 24-yard line, only to lose the ball when Bailey again forced a fumble while sacking Hoyer on fourth down. The Texans' defense forced a punt, but Dustin Colquitt's 56-yard kick pinned them back on their 8-yard line. On the next play, Hoyer was intercepted by Sean Smith on the 20-yard line, leading to Santos' third field goal to make the final score 30–0. Smith completed 17 of 22 passes for 190 yards with a touchdown and an interception. His top target was Kelce, who caught eight passes for 128 yards, while Ware was the top rusher for the Chiefs with 67 yards and a touchdown. Bailey had four tackles, two sacks, and two forced fumbles. Hoyer was held to just 15 of 34 passes for 134 yards and was intercepted four times. Alfred Blue was the game's leading rusher with 99 yards on 17 carries. Cushing had 13 tackles and an interception, while linebacker Whitney Mercilus had five tackles and three sacks. PIT – Chris Boswell 39-yard field goal, 2:27. Steelers 3–0. Drive: 6 plays, 20 yards, 2:30. PIT – Chris Boswell 30-yard field goal, 0:33. Steelers 6–0. Drive: 9 plays, 63 yards, 1:16. PIT – Chris Boswell 34-yard field goal, 10:09. Steelers 9–0. Drive: 5 plays, 47 yards, 2:04. PIT – Martavis Bryant 10-yard pass from Ben Roethlisberger (2-pt conv. – pass failed), 5:02. Steelers 15–0. Drive: 6 plays, 82 yards, 3:29. CIN – Jeremy Hill 1-yard run (Mike Nugent kick), 13:57. Steelers 15–7. Drive: 3 plays, 46 yards, 0:50. CIN – Mike Nugent 36-yard field goal, 5:12. Steelers 15–10. Drive: 13 plays, 70 yards, 5:59. CIN – A. J. Green 25-yard pass from AJ McCarron (2-pt conv. – run failed), 1:50. Bengals 16–15. Drive: 7 plays, 45 yards, 1:38. PIT – Chris Boswell 35-yard field goal, 0:14. Steelers 18–16. Drive: 9 plays, 74 yards, 1:09. This game ended up being a rain-soaked vicious battle between two AFC North rivals, filled with injuries and personal fouls on both sides. After falling behind 15–0, the Bengals scored three times in the fourth quarter to take a 16–15 lead. But with less than a minute left in the game, two consecutive personal fouls against Cincinnati's defense got the Steelers close enough for Chris Boswell to make a 35-yard field goal with 18 seconds left on the clock. The game started off as a defensive battle with both teams punting at the end of its first eight drives. With less than six minutes left in the second quarter, Bengals linebacker Vontaze Burfict forced a fumble from Markus Wheaton that safety George Iloka recovered on the Cincinnati 47-yard line. But a few plays later, Bengals quarterback A. J. McCarron threw an interception to Antwon Blake, who returned it 35 yards to the Bengals' 41-yard line. A 23-yard completion from Ben Roethlisberger to Antonio Brown on the ensuing drive set up Boswell's 39-yard field goal. Following a punt, Roethlisberger completed a 16-yard pass to running back Fitzgerald Toussaint and a 24-yard pass to Wheaton – with a personal foul penalty on safety Shawn Williams adding another 15 yards – to set up Boswell's 30-yard field goal just before halftime. Despite the Steelers' slim 6–0 lead, they had dominated the stat sheet, holding Cincinnati to just 56 yards and two first downs. On the opening drive of the second half, the Bengals seemed primed to score when Jeremy Hill broke free for a 38-yard run to the Steelers' 29-yard line. But on the next play, McCarron lost a fumble due to a hit by linebacker Jarvis Jones. Defensive end Cam Thomas recovered the ball and ended up losing it while being tackled, then defensive back William Gay picked it up and returned it for a touchdown. However, replays showed that Thomas was down by contact before he lost the fumble, and a 15-yard penalty against Gay for excessive celebration moved the ball all the way back to Pittsburgh's 36-yard line. Receiver Martavis Bryant's 44-yard run on an end-around play then set up Boswell's 34-yard field goal that gave the Steelers a 9–0 lead. Following a punt, Roethlisberger completed a 60-yard pass to Brown on the Bengals' 10-yard line. Then he threw a pass in the back of the end zone to Bryant, who made a diving somersault catch and maintained possession for a touchdown by pinning the ball against one leg while falling to the ground. However, Pittsburgh's two-point conversion attempt failed, so the score remained 15–0. Cincinnati responded with a drive to the Steelers' 23-yard line, but committed another turnover when running back Giovani Bernard lost a fumble that was forced and recovered by linebacker Ryan Shazier, who leveled Bernard with a devastating helmet leading hit that knocked the running back out of the game. Shazier was not penalized for the hit, much to the dismay of the home crowd. On the last play of the third quarter, Burfict sacked Roethlisberger for a 12-yard loss, forcing a punt from the Steelers' 5-yard line and temporarily knocking Roethlisberger out of the game with a shoulder injury. After Jordan Berry's 41-yard punt gave the Bengals a first down on the Pittsburgh 46-yard line, Steelers defensive back Will Allen committed a 42-yard pass interference penalty while trying to cover A. J. Green. Hill then got the ball into the end zone with consecutive carries, the second a 1-yard touchdown run that made the score 15–7. The Steelers, now led by Landry Jones, started off their next drive well, as Jordan Todman rushed for a 25-yard gain on the second play. But an 11-yard sack by Carlos Dunlap and Pat Sims ultimately forced the Steelers to punt. McCarron started the Bengals' drive off with two completions to Hill for 24 total yards. Later on, he converted a 3rd-and-9 with an 18-yard completion to tight end Tyler Eifert, and eventually the Bengals got close enough for Mike Nugent to kick a 36-yard field goal, making the score 15–10 with 5:17 left. The Steelers had to punt after three plays on their ensuing possession, and Adam Jones' 24-yard return gave the Bengals the ball on the Pittsburgh 45-yard line. McCarron soon faced a 4th-and-2 situation, but converted with a 9-yard completion to Marvin Jones. Then when faced with 3rd-and-7, he launched a 25-yard touchdown pass to Green. After their two-point conversion failed, the Bengals held a 16–15 lead with 1:45 left. On the first play after the kickoff, Landry Jones threw an interception to Burfict on the Steelers' 26-yard line. He celebrated by running all the way through the tunnel. But with the game now seemingly in the Bengals' control, they gave the ball right back on the next play when Shazier forced a fumble from Hill that was recovered by defensive back Ross Cockrell. Now with the ball on his own 11-yard line with 1:23 left, Roethlisberger returned to lead his team 74 yards in nine plays for the game-winning score. After several short completions moved the ball to the 37-yard line, Pittsburgh faced a 4th-and-3, but overcame it on Brown's 12-yard reception. On the next play, with just 22 seconds left, Roethlisberger threw a pass intended for Brown. The pass was incomplete, but Burfict was flagged for a personal foul for contact with Brown's helmet. Brown was injured on the play, and as he was being attended and officials were dealing with both teams, Adam Jones was flagged for a personal foul after an altercation with Steelers linebackers coach Joey Porter, giving the Steelers another 15 yards and moving the ball to the Bengals' 17-yard line. On the next play, Boswell kicked a 35-yard field goal with 18 seconds left to win the game. Roethlisberger completed 18 of 31 passes for 221 yards and a touchdown, while Brown caught seven passes for 119 yards and Todman was the game's leading rusher with 65 yards. Shazier had 13 tackles – nine of which were solo tackles – a pair of forced fumbles, and a fumble recovery. McCarron completed 23 of 41 passes for 213 yards, with a touchdown and an interception. Hill rushed for 50 yards and a touchdown, while also catching three passes for 27 yards. Green caught five passes for 71 yards and a touchdown, while Burfict had six tackles, a sack, an interception, and a forced fumble. This marked another round of playoff futility for the Bengals, who lost their fifth playoff game in a row after starting the season 8–0 and finishing with a franchise record tying 12–4 record, despite losing starting quarterback Andy Dalton to a broken thumb injury in week 14. The Bengals have now lost an NFL record eight consecutive playoff games since 1990, while coach Marvin Lewis' playoff record fell to 0–7, the most losses ever by a coach without a postseason win. After the game, Dalton stated that "This locker room should feel a lot different right now. We won that game and then we didn't". Sportswriter Mike Freeman called this game "one of the dirtiest and ugliest contests in the modern era of the sport". Burfict received a 3-game suspension for his hit on Brown, while four players and two assistant coaches also received fines. Jones received the most severe fine at $28,000, while Steelers lineman Ramon Foster was fined $17,000. Bengals defensive linemen Wallace Gilberry and Domata Peko each received an $8,600 fine, while Porter and fellow Steelers assistant coach Mike Munchak were fined $10,000 each. MIN – Blair Walsh 22-yard field goal, 1:01. Vikings 3–0. Drive: 10 plays, 25 yards, 5:52. MIN – Blair Walsh 43-yard field goal, 7:04. Vikings 6–0. Drive: 5 plays, 28 yards, 2:45. MIN – Blair Walsh 47-yard field goal, 0:02. Vikings 9–0. Drive: 8 plays, 19 yards, 4:39. SEA – Doug Baldwin 3-yard pass from Russell Wilson (Steven Hauschka kick), 11:37. Vikings 9–7. Drive: 7 plays, 80 yards, 3:25. SEA – Steven Hauschka 46-yard field goal, 8:04. Seahawks 10–9. Drive: 7 plays, 12 yards, 2:33. In their final game at TCF Bank Stadium – prior to the Vikings' move to U.S. Bank Stadium for the 2016 season – Minnesota kicker Blair Walsh missed a 27-yard field goal attempt with 22 seconds remaining as the Seahawks held on to win 10–9. The temperature at kickoff was −6 °F (−21 °C), making this the third coldest game in NFL history. On their first possession Seattle went three-and-out, but punter Jon Ryan bobbled a low snap and was unable to get off a punt, giving Minnesota posssession at the Seattle 29-yard line. The Vikings drove to the 4-yard line but had to settle for a Walsh field goal to open the scoring. After both teams punted on their next possession, Seattle drove to the Vikings' 30-yard line and faced a 4th-and-13. Rather than attempt a field goal, Russell Wilson threw a pass to Fred Jackson who was tackled short of a first down after a 7-yard gain. Neither team could score for the rest of the half, and Minnesota went to halftime leading 3–0. Both teams combined for 185 total yards in the half, the lowest in a playoff game since 2005. On the first possession of the second half Seattle drove into Minnesota territory and again went for it on fourth down, only for Wilson to be intercepted by Trae Waynes. Minnesota was then helped by a penalty for Cliff Avril roughing the passer, and Walsh kicked a 43-yard field goal to give them a 6–0 lead. Seattle went three-and-out on their next drive, and Minnesota began their drive in Seahawks territory after a horse collar tackle on the punt return. They settled for another Walsh field goal, this time from 47-yards out, to take a 9–0 lead into the fourth quarter. With the ball on the Vikings' 39-yard line on the ensuing drive, Wilson could not handle the snap and recovered it back at his own 45-yard line, but then found Tyler Lockett for a 35-yard completion. Two plays later Wilson threw a touchdown to Doug Baldwin, cutting the deficit to 9–7. On Minnesota's second play of the next drive Kam Chancellor forced an Adrian Peterson fumble which was recovered by Ahtyba Rubin at the Vikings' 40-yard line. Steven Hauschka converted on a 46-yard field goal to put Seattle ahead 10–9 with 8:04 remaining. Both teams punted on their next two drives, and Minnesota took possession with 1:42 left on their own 39-yard line. With a 19-yard pass interference call on Chancellor and a 24-yard pass from Teddy Bridgewater to Kyle Rudolph, Minnesota advanced to the Seattle 9-yard line with 26 seconds remaining. Walsh, however, kicked the 27-yard field goal wide left, allowing Seattle to kneel out the clock and preserve the victory. Bridgewater finished as the leading passer with 146 yards, while Wilson recorded 142 yards with a touchdown and an interception. Seattle held Peterson, the league's leading rusher during the regular season, to just 45 yards on 23 carries. The win was Wilson's seventh playoff victory, the most by a quarterback within his first four seasons. Seattle became just the fifth team to win a playoff game despite scoring ten or fewer points, and the first since 1997. WAS – Preston Smith sacked Aaron Rodgers in end zone for safety, 10:27. Redskins 2–0. WAS – Dustin Hopkins 25-yard field goal, 4:51. Redskins 5–0. Drive: 10 plays, 48 yards, 5:36. WAS – Jordan Reed 24-yard pass from Kirk Cousins (kick failed; hru), 13:02. Redskins 11–0. Drive: 7 plays, 64 yards, 3:22. GB – Randall Cobb 12-yard pass from Aaron Rodgers (Mason Crosby kick), 9:04. Redskins 11–7. Drive: 9 plays, 80 yards, 3:58. GB – Mason Crosby 43-yard field goal, 2:54. Redskins 11–10. Drive: 8 plays, 30 yards, 3:11. GB – Davante Adams 10-yard pass from Aaron Rodgers (Mason Crosby kick), 0:28. Packers 17–11. Drive: 9 plays, 60 yards, 1:54. WAS – Kirk Cousins 3-yard run (Dustin Hopkins kick), 9:41. Redskins 18–17. Drive: 9 plays, 73 yards, 5:19. GB – James Starks 4-yard run (Mason Crosby kick), 4:12. Packers 24–18. Drive: 11 plays, 80 yards, 5:29. GB – Eddie Lacy 2-yard run (2-pt conv. – Aaron Rodgers pass to Jared Abbrederis), 12:23. Packers 32–18. Drive: 10 plays, 76 yards, 5:39. GB – Mason Crosby 29-yard field goal, 4:39. Packers 35–18. Drive: 4 plays, 6 yards, 0:19. Green Bay erased an early 11–0 deficit by scoring on five consecutive possessions on the way to a 35–18 victory over the Redskins. Early in the first quarter, Tress Way's 57-yard punt and a 12-yard penalty against Green Bay pinned the Packers back at their own 8-yard line. A few plays later, Preston Smith sacked Aaron Rodgers in the end zone for a safety, giving Washington a 2–0 lead. On the ensuing drive the Redskins drove to the Green Bay 1-yard line with a 14-yard pass from Kirk Cousins to DeSean Jackson that was initially ruled a touchdown but reversed upon review. The Packers defense held the Redskins to a 25-yard Dustin Hopkins field goal, and Washington led 5–0 at the end of the first quarter. Early in the second quarter, Washington drove 64 yards in seven plays, including a 20-yard reception by tight end Jordan Reed and a 13-yard catch by Pierre Garçon, to score on Cousins' 24-yard touchdown pass to Reed; Hopkins missed the extra point, therefore Washington took a 11–0 lead. Green Bay, however, responded by scoring 17 points by the end of the half. First, a 34-yard completion from Rodgers to James Jones set up a 12-yard touchdown pass to Randall Cobb. Then linebacker Mike Neal forced and recovered a fumble while sacking Cousins on the Packers' 46-yard line, resulting in a 30-yard drive that ended with Mason Crosby's 43-yard field goal. Washington had to punt on their next drive, and Micah Hyde returned the ball 17 yards to the Packers 40-yard line. Green Bay then drove 60 yards, including a 20-yard reception by Davante Adams on 3rd-and-2, to score on Rodgers' 10-yard touchdown toss to Adams, giving the team a 17–11 lead with 28 seconds left in the half. Washington regrouped on their first possession of the second half, scoring on a 9-play, 74-yard drive, starting off with a 21-yard reception by Garçon, and Alfred Morris had a 19-yard carry on the next play. Cousins later completed a 17-yard pass to Reed before finishing the drive with a 3-yard touchdown run, regaining the lead at 18–17. On the Packers' ensuing drive, they faced a 4th-and-1 situation on the Redskins' 45-yard line. In what turned out to be a critical play, Eddie Lacy picked up the first down with an 11-yard run. Lacy added a 30-yard run on the next play, and James Starks finished the drive with a 4-yard rushing touchdown, giving the Packers a 24–18 lead. On their next drive the Packers scored for the fifth straight possession as a 22-yard carry by Starks set up Lacy's 2-yard touchdown run and Jared Abbrederis' 2-point conversion catch to make the score 32–18. Washington was unable to score again as Cousins was sacked twice on fourth down plays, once by linebacker Nick Perry and once by Neal. Perry's sack resulted in a turnover on the Redskins' 17-yard line, leading to Crosby's 29-yard field goal that made the final score 35–18. Rodgers finished the game with 210 yards and a pair of touchdowns, while Cousins recorded 329 yards with a touchdown. Reed was the top receiver with nine receptions for 120 yards, becoming the first Redskins tight end with 100 receiving yards in a playoff game. In contrast to wild card weekend, all four higher seeded teams won their games this weekend. Playing in an NFL record-tying 30th postseason game, Patriots quarterback Tom Brady completed 28 of 42 passes for 302 yards and two touchdowns, without being sacked or throwing any interceptions, and also rushing for a score as he led the team to their fifth consecutive AFC championship game. New England scored on their opening drive, moving the ball 80 yards in 11 plays. When faced with 3rd-and-13 on the Chiefs' 43-yard line, Brady completed a 32-yard pass to tight end Rob Gronkowski, and later found Gronkowski in the end zone for an 8-yard score. Kansas City responded with a 17-play, 64-yard drive, including quarterback Alex Smith's 15-yard run on 3rd-and-13. The Patriots defense managed to halt the drive on their own 16-yard line, forcing the Chiefs to settle for Cairo Santos' 34-yard field goal to make the score 7–3. In the second quarter, Chiefs punter Dustin Colquitt's 33-yard kick pinned the Patriots back on their own 4-yard line, with a penalty against New England taking away another two yards. But it did not stop New England from driving 98 yards in 11 plays on a drive where they faced only two third downs. The key play of the drive was a 42-yard completion from Brady to receiver Keshawn Martin. Brady later ran the ball 10 yards to the Chiefs' 1-yard line on a scramble, and then took the ball into the end zone on the next play, giving the Patriots a 14–3 lead. Knile Davis returned the ensuing kickoff 34 yards, then Charcandrick West subsequently rushed for a 17-yard gain and Smith completed a 26-yard pass to Jason Avant; the team drove to a 32-yard Santos field goal that made the score 14–6 at halftime. Kansas City started off the second half with a drive to the Patriots' 40-yard line. But linebacker Dont'a Hightower made a critical play, forcing and recovering a fumble from Davis after he caught a 9-yard pass. Taking the ball at the Chiefs' 31-yard line, Brady completed five consecutive passes for double-digit gains, the last one a 16-yard touchdown throw to Gronkowski that gave the team a 21–6 lead. Kansas City struck right back, converting two third downs and one fourth down on an 80-yard drive featuring a 26-yard reception by Avant. Smith finished the drive with a 10-yard touchdown pass to Albert Wilson, cutting their deficit to 21–13 with two minutes left in the third quarter. A few plays into the fourth quarter, Stephen Gostkowski gave the Patriots a 24–13 lead with a 40-yard field goal at the end of a drive that was sparked by Brady's 29-yard completion to running back James White. Kansas City had to punt on their next drive, and Danny Amendola returned the ball 22 yards to the Chiefs' 32-yard line, setting up another Gostkowski field goal that upped the New England lead to 27–13. Kansas City responded with a drive to the New England 49-yard line, but ended up turning the ball over on downs. Following a punt Kansas City got the ball back with 6:29 left. They proceeded to drive 80 yards in 16 plays for a score, including a 13-yard catch by Avant on 4th-and-8 and a 19-yard reception by Wilson. West finished the drive with a 1-yard touchdown run that made the score 27–20, with 1:13 remaining. Kansas City attempted an onside kick, but failed to recover it. With all three of their timeouts left, they still had a chance to force a punt, but on the second play of New England's ensuing drive, Brady's 12-yard pass off a deflection to Julian Edelman sealed the victory for the Patriots, and ended Kansas City's 11-game winning streak. Edelman was the top receiver of the game with 10 receptions for 100 yards. Gronkowski caught seven passes for 83 yards and a pair of touchdowns; with eight career postseason touchdowns, Gronkowski – in his sixth season – set an all-time record for postseason touchdowns by a tight end. Smith completed 29 of a career high 50 pass attempts for 246 yards and a touchdown. Avant, who caught just 15 passes during the season, was the Chiefs' leading receiver with four receptions for 69 yards. West was the leading rusher of the game with 61 yards and a touchdown, adding two receptions for 15 yards. ARI – Michael Floyd 8-yard pass from Carson Palmer (Chandler Catanzaro kick), 6:48. Cardinals 7–0. Drive: 11 plays, 42 yards, 6:21. GB – Mason Crosby 28-yard field goal, 11:22. Cardinals 7–3. Drive: 17 plays, 85 yards, 7:31. GB – Mason Crosby 34-yard field goal, 0:57. Cardinals 7–6. Drive: 17 plays, 71 yards, 7:55. GB – Jeff Janis 8-yard pass from Aaron Rodgers (Mason Crosby kick), 10:17. Packers 13–7. Drive: 6 plays, 81 yards, 3:05. ARI – Chandler Catanzaro 28-yard field goal, 5:05. Packers 13–10. Drive: 10 plays, 74 yards, 5:12. ARI – Michael Floyd 9-yard pass from Carson Palmer (Chandler Catanzaro kick), 3:44. Cardinals 17–13. Drive: 14 plays, 80 yards, 7:09. ARI – Chandler Catanzaro 36-yard field goal, 1:55. Cardinals 20–13. Drive: 4 plays, 6 yards, 0:43. GB – Jeff Janis 41-yard pass from Aaron Rodgers (Mason Crosby kick), 0:00. Tied 20–20. Drive: 6 plays, 86 yards, 1:55. ARI – Larry Fitzgerald 5-yard pass from Carson Palmer, 13:55. Cardinals 26–20. Drive: 3 plays, 80 yards, 1:05. Green Bay quarterback Aaron Rodgers' 41-yard touchdown pass to Jeff Janis that tied the game on the last play of regulation was quickly answered by Cardinals quarterback Carson Palmer, who threw a 75-yard completion to Larry Fitzgerald on the first play of overtime and then a 5-yard touchdown pass to him to win the game. This gave Palmer his first career playoff win at age 36, after 13 seasons in the NFL. After each team punted on their first possession, Patrick Peterson's 12-yard punt return gave the Cardinals a first down on the Packers' 42-yard line. Arizona then drove 42 yards in 11 plays, including a 2-yard run by David Johnson on 4th-and-1, to go up 7–0 on Palmer's 8-yard touchdown pass to receiver Michael Floyd. Following another exchange of punts, Green Bay drove 85 yards in 17 plays, featuring a 19-yard scramble by Rodgers, to cut the score to 7–3 on Mason Crosby's 28-yard field goal. This drive had two big plays nullified by penalties; one of which was a 51-yard one-handed catch by Randall Cobb that was wiped out by offsetting penalties on both teams. Not only did this eliminate the catch, but Cobb – the Packers' leading receiver during the season – was injured on the play and missed the rest of the game. Later on, Rodgers threw a pass that Peterson intercepted and returned 100 yards for a touchdown, but this was eliminated by an illegal use of hands penalty on defensive lineman Frostee Rucker. Following an Arizona punt, the Packers went on another long scoring drive, this one covering 71 yards in 17 plays and taking 7:55 off the clock. Receiver Jared Abbrederis had the drive's longest gain with an 18-yard reception, while Crosby added another field goal, making the score 7–6 with 55 seconds left in the half. Four plays into the third quarter, Cardinals safety Rashad Johnson intercepted a pass from Rodgers on the Packers' 47-yard line. A few plays later, Palmer also threw an interception, which was taken in by safety Ha Ha Clinton-Dix. On the second play after the turnover, Eddie Lacy gained 14 yards. Then he stormed through the line for a 61-yard run to the Arizona 8-yard line. Rodgers eventually finished the drive with an 8-yard pass to Janis, giving Green Bay their first lead at 13–7. The Cardinals struck back with a 10-play, 74-yard drive, featuring a 32-yard reception by Fitzgerald, to cut the score to 13–10 with Chandler Catanzaro's 28-yard field goal. Following a Packers punt, Arizona drove to the Green Bay 10-yard line, but on the second play of the fourth quarter, cornerback Damarious Randall intercepted a pass from Palmer in the end zone. After Green Bay punted, Arizona got the ball on their own 20-yard line with 10:53 left. Palmer completed a 21-yard pass to John Brown on the second play of the drive, and later completed a 13-yarder to Fitzgerald. Eventually, the team got a first down on the Packers' 19-yard line. On the next play after that, Palmer threw a pass that bounced out of the hands of defensive back Sam Shields. After an incomplete pass, Palmer threw a pass to Johnson, who just barely managed to back-peddle across the first down marker as he was falling to the ground. Then from the 9-yard line, Palmer threw a pass that was deflected by Randall, but fell right into the hands of Floyd for a touchdown, giving the Cardinals a 17–13 lead with 3:44 left. A few plays into their ensuing drive, Green Bay faced 4th-and-5 on their own 25-yard line. With only one timeout remaining, they decided to go for the first down, but Rodgers' pass was incomplete and the Cardinals took over with 2:38 left. Arizona was unable to get a first down on their drive, which included an incomplete pass that helped the Packers save some time. Catanzaro finished the drive with a 36-yard field goal, putting the Cardinals up 20–13, but the team had only managed to run 43 seconds off the clock, 1:55 remained. Green Bay got the ball back on their own 14-yard line with 1:50 left. Two incompletions and a 10-yard sack by Dwight Freeney brought up 4th-and-20, but Rodgers managed to overcome the situation by launching a 60-yard completion to Janis on the Arizona 36-yard line. With time ticking away, Rodgers rushed his team back to the line, appearing at first to want to spike the ball, but ran the play – the team could not get set before the snap, resulting in an illegal motion penalty that pushed them back five yards and cost them more time. After an incompletion, only five seconds remained in the game. Rodgers, took the snap, ran left and launched a Hail Mary pass to the end zone just before being leveled by linebacker Markus Golden. Janis then made a leaping catch in the end zone between two defenders for a 41-yard touchdown reception, sending the game into overtime. This was the first game-tying touchdown pass on the last play of regulation in postseason history and the second time that Rodgers threw a Hail Mary touchdown pass at the end of regulation in the season, after the Miracle in Motown. Arizona won the coin toss – which had to be redone after the coin did not flip in the air on the first attempt – and elected to receive. On their first play after the touchback, Palmer took the snap, evaded a tackle attempt by linebacker Mike Neal, ran right, and threw the ball to Fitzgerald on the left side the field just before being reached by defensive tackle Mike Daniels. Fitzgerald caught the ball wide open near the Arizona 35-yard line and broke three tackles as he took off for a 75-yard gain before he was dragged down by Casey Hayward on the Packers' 5-yard line. After an incompletion, Palmer flipped the ball to Fitzgerald on a shovel pass, and he took it into the end zone for the game winning score, giving the Cardinals their first playoff victory since 2009 – also a home overtime win against the Packers they had won with a touchdown on the third play from scrimmage in overtime – and their first NFC Championship game since 2008. CAR – Jonathan Stewart 4-yard run (Graham Gano kick), 12:30. Panthers 7–0. Drive: 4 plays, 75 yards, 2:30. CAR – Luke Kuechly 14-yard interception return (Graham Gano kick), 11:38. Panthers 14–0. CAR – Jonathan Stewart 1-yard run (Graham Gano kick), 14:18. Panthers 21–0. Drive: 15 plays, 86 yards, 8:44. CAR – Graham Gano 48-yard field goal, 12:37. Panthers 24–0. Drive: 4 plays, −1 yard, 1:35. CAR – Greg Olsen 19-yard pass from Cam Newton (Graham Gano kick), 6:26. Panthers 31–0. Drive: 9 plays, 54 yards, 4:45. SEA – Jermaine Kearse 13-yard pass from Russell Wilson (Steven Hauschka kick), 13:27. Panthers 31–7. Drive: 4 plays, 35 yards, 1:33. SEA – Tyler Lockett 33-yard pass from Russell Wilson (Steven Hauschka kick), 7:40. Panthers 31–14. Drive: 7 plays, 63 yards, 2:40. SEA – Jermaine Kearse 3-yard pass from Russell Wilson (Steven Hauschka kick), 6:04. Panthers 31–21. Drive: 9 plays, 73 yards, 3:28. SEA – Steven Hauschka 36-yard field goal, 1:12. Panthers 31–24. Drive: 11 plays, 60 yards, 1:37. The Panthers jumped out to a 31–0 halftime lead and held off a second half rally from the Seahawks to prevail 31–24 and advance to the NFC Championship for the first time since 2005. Panthers running back Jonathan Stewart ran for 59 yards to the Seahawks 16-yard line on the first offensive play of the game, then scored a touchdown from four yards out to give Carolina an early lead. Then, on the Seahawks' second play, Luke Kuechly intercepted a pass from Russell Wilson and returned it 14 yards for a touchdown, giving Carolina a 14–0 lead less than four minutes into the game. After forcing a Seahawks punt, Carolina mounted a 15-play, 86-yard drive which featuring a 27-yard reception by tight end Greg Olsen and culminated in a Stewart 1-yard touchdown run early in the second quarter. Wilson then threw his second interception on the first play of the next drive, this time to Cortland Finnegan on the Seattle 29-yard line, and a Graham Gano 48-yard field goal put Carolina up 24–0. After a Seahawks three-and-out, Carolina drove 54 yards and scored another touchdown with a Cam Newton 19-yard pass Olsen. Now trailing 31–0, Seattle drove to the Carolina 18-yard line but turned the ball over on downs when Doug Baldwin was tackled a yard short of a first down on 4th-and-5. Seattle had another chance to cut the deficit at the end of the half, but Steven Hauschka missed a 55-yard field goal as time expired. Seattle got on the board on the first drive of the second half after Tyler Lockett returned the opening kickoff to 50 yards to midfield and Carolina was called for an unnecessary roughness penalty. Wilson found Jermaine Kearse for a 13-yard touchdown. After forcing a Panthers punt, Seattle drove 63 yards for another touchdown. Wilson rushed for 14 yards, completed a 16-yard pass to Kearse, and eventually finished the drive with 33-yard scoring pass to Lockett, cutting the deficit to 31–14. Seattle drove into Carolina territory again on their next drive which included a 17-yard first down run by DeShawn Shead on a fake punt, but Wilson was sacked for a 14-yard loss by Josh Norman and they were unable to score. On their next drive Wilson completed a 27-yard pass to Lockett that was originally ruled incomplete but overturned on review, then threw another touchdown to Kearse from three yards out to get to within 10 points with 6:11 remaining. Carolina was forced to punt again on their next possession, but Seattle was unable to find the end zone and settled for a 36-yard field goal. Now trailing by a touchdown with 1:12 remaining and only one timeout left, Seattle attempted an onside kick which was recovered by Carolina linebacker Thomas Davis, allowing the Panthers to run out the clock and preserve the victory. Wilson finished with 366 yards on 31 of 48 passing with three touchdowns and two interceptions, while Newton had 161 yards and one touchdown. Stewart gained 106 yards on the ground, the first time in 27 games that Seattle had allowed a 100-yard rusher. Seahawks running back Marshawn Lynch returned to the lineup after missing eight games but was held to just 20 yards on six carries. Kearse was the leading receiver with 11 receptions for 110 yards and two touchdowns. Their 31 points was a new Panthers franchise record in a playoff game. Seattle lost despite outgaining Carolina 280–72 in total yards during the second half. In a tough defensive struggle in which both teams could only get the ball into the end zone once, Denver pulled ahead by scoring 11 points in the final three minutes of the game. At the end of the game's opening possession, Broncos safety Omar Bolden returned a punt 42 yards to the Pittsburgh 30-yard line, setting up Brandon McManus' 28-yard field goal. Later in the first quarter, Britton Colquitt's 57-yard punt pinned the Steelers back at their own 3-yard line. Pittsburgh was unable to get a first down with their ensuing drive, and Jordan Berry's 27-yard punt gave Denver a first down on the Steelers 31. Despite their excellent starting position, Denver could not get into the end zone and ended up with another McManus field goal to take a 6–0 lead. Pittsburgh took the ball back and stormed 80 yards in just five plays. First, Ben Roethlisberger completed a 23-yard pass to receiver Martavis Bryant. Then Bryant took a handoff on a reverse and raced 40 yards to the Broncos 16-yard line. Fitzgerald Toussaint finished the drive with two carries; the first for 15 yards and the second a 1-yard score that gave Pittsburgh a 7–6 lead with less than two minutes left in the first quarter. On Pittsburgh's next possession, Roethlisberger's 58-yard completion to Darrius Heyward-Bey set up a 43-yard Chris Boswell field goal that increased their lead to 10–6. Denver had a chance to respond with a drive to the Steelers 37-yard line, but they turned the ball over with an incomplete pass on 4th-and-3. Late in the second quarter, Berry booted a 50-yard punt that gave the Broncos the ball at their own 5-yard line. But a 34-yard burst by running back C. J. Anderson sparked a 62-yard drive then ended with McManus' 51-yard field goal, cutting the score to 10–9 on the last play of the first half. After forcing Denver to punt of the first drive of the second half, Pittburgh put together a 69-yard scoring drive featuring a 58-yard reception by Bryant. Boswell finished it with a 28-yard field goal, increasing the Steelers lead to 13–9. Denver had to punt again on their next drive, but Colquitt once again gave the team a big assist, this time with a 51-yard punt that put the ball on the Steelers 6-yard line. Pittsburgh could not get a first down, and Berry's 43-yard punt gave the ball back to Denver on their own 47-yard line. 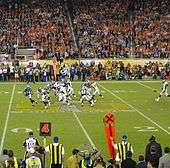 The Broncos were only able to move the ball 30 yards with their ensuing drive, but it was enough for McManus to make a 41-yard field goal, trimming their deficit to 13–12. Pittsburgh took the ball back and drove to the Broncos 34-yard line, but were halted there and decided to punt instead of trying a long field goal. The Broncos also ended up punting, and Pittsburgh drove back to the Denver 34-yard line with three consecutive Roethlisberger completions for 39 total yards. But on the next play, the first turnover of the game occurred when safety Bradley Roby forced a fumble from Toussaint that was recovered by linebacker DeMarcus Ware. Now with 9:52 left in the game, 39-year old Broncos quarterback Peyton Manning took to the field and led the team 65 yards in 13 plays for the go-ahead score. The key play of the drive was a 31-yard completion from Manning to rookie receiver Bennie Fowler on 3rd-and-12 from the Broncos 33-yard line. Running back Ronnie Hillman also made a big impact, with five carries for 18 yards. After Fowler's catch, the Broncos would not face another third down on the drive until the last play of the drive, when Anderson converted a 3rd-and-goal with a 1-yard touchdown run. Then Manning completed a pass to Demaryius Thomas for a 2-point conversion, giving the Broncos a 20–13 lead with three minutes left on the clock. Pittsburgh started off their next drive with an 18-yard catch by Bryant, but ended up facing 4th-and-5 on their own 43-yard line with less than two minutes left. They tried to pick up a first down, but Ware sacked Roethlisberger for a 13-yard loss. Taking over at the Steelers 30-yard line, Denver forced Pittsburgh to use up all their timeouts with three consecutive running plays. Then McManus kicked a 45-yard field goal that gave the Broncos a 23–13 lead with 53 seconds to go. A 20-yard pass interference penalty on safety T. J. Ward and a 22-yard reception by Bryant enabled Boswell to bring the deficit back to one score with a 47-yard field goal. But Anderson eliminated any chance of a comeback by recovering Boswell's ensuing onside kick. Manning completed 22 of 37 passes for 222 yards. Emmanuel Sanders caught five of them for 85 yards. Anderson was the top rusher of the game with 72 yards and a touchdown, while also catching two passes for 11 yards. Ware had three tackles, a sack, and a fumble recovery. McManus tied a playoff record with five field goals. Roethlisberger finished the game 24 of 37 for 339 yards. Bryant caught nine passes for 154 yards and had two carries for 40 yards. Linebacker James Harrison had seven tackles and a sack. DEN – Owen Daniels 21-yard pass from Peyton Manning (Brandon McManus kick), 7:32. Broncos 7–0. Drive: 11 plays, 83 yards, 5:30. NE – Steven Jackson 1-yard run (kick failed), 1:49. Broncos 7–6. Drive: 2 plays, 22 yards, 0:34. DEN – Owen Daniels 12-yard pass from Peyton Manning (Brandon McManus kick), 13:46. Broncos 14–6. Drive: 3 plays, 16 yards, 0:49. NE – Stephen Gostkowski 46-yard field goal, 7:07. Broncos 14–9. Drive: 13 plays, 48 yards, 6:44. DEN – Brandon McManus 52-yard field goal, 0:38. Broncos 17–9. Drive: 6 plays, 23 yards, 1:13. NE – Stephen Gostkowski 38-yard field goal, 10:31. Broncos 17–12. Drive: 8 plays, 47 yards, 2:49. DEN – Brandon McManus 31-yard field goal, 10:06. Broncos 20–12. Drive: 10 plays, 48 yards, 4:58. Denver's defense sacked Patriots quarterback Tom Brady four times, knocked him down 20 times, intercepted two of his passes, forced a turnover on downs twice in the fourth quarter, and broke up a 2-point conversion attempt with 17 seconds left that enabled them to escape with a narrow 20–18 win, while the Patriots' defense sacked and knocked down Peyton Manning many times. With the win, the Broncos advanced to their second Super Bowl in three years and tied the Pittsburgh Steelers, Dallas Cowboys, and the Patriots for the most Super Bowl appearances with eight. On Denver's first drive, quarterback Peyton Manning completed 4 of 6 passes for 60 yards on an 83-yard drive and then ended with his 21-yard touchdown pass to tight end Owen Daniels. Later in the quarter, Manning threw the ball on a screen pass to Ronnie Hillman that was broken up and then picked up by linebacker Jonathan Freeny. The play was initially ruled an incompletion, but a replay challenge from Bill Belichick changed the play to a New England fumble recovery on the Broncos 22-yard line, as officials ruled Manning's throw was a backwards pass instead of a forward pass. Brady completed a 20-yard pass to running back Brandon Bolden on the next play, with a penalty on Denver moving the ball up to the 1-yard line, and then Steven Jackson ran the ball into the end zone on the next play. However, Stephen Gostkowski, one of only five kickers to go through the regular season without missing an extra point, missed the extra point wide right, keeping the team behind with a score of 7–6. Denver had to punt on their next drive, but a few plays into the second quarter, Brady threw a pass that was intercepted by linebacker Von Miller and returned four yards to the Patriots 16-yard line. Manning then scored on another touchdown pass to Daniels, this one from 12 yards, to give the Broncos a 14–6 lead. New England responded with a 48-yard drive, with Brady completing a 19-yard pass to tight end Rob Gronkowski and later scrambling for an 11-yard gain on 3rd-and-10. But after reached a 3rd-and-3 on the Broncos 22-yard line, Miller sacked Brady for a 6-yard loss, forcing the team to settle for 14–9 score on Gostkowski's 46-yard field goal. The next time New England got the ball, Brady was intercepted by safety Darian Stewart, who returned the ball eight yards to the Broncos 44-yard line. But a false start penalty and a sack by Alan Branch shut the drive down and Denver ended up punting. Britton Colquitt's 48-yard kick pinned the Pats back at their own 12-yard line, and following another punt, the Broncos got the ball back again on their 44-yard line. This time they managed to move the ball 23 yards and score on Brandon McManus' 52-yard field goal with 33 seconds left in the half, making the score 17–9 going into halftime. On New England's first drive of the third quarter, Brady completed a 31-yard pass to Gronkowski that set up Gostkowski's 38-yard field goal, cutting their deficit to 17–12. This would be the only score of the quarter as both teams punted on each of their next two drives. On the last play of the quarter, Denver receiver Jordan Norwood returned Ryan Allen's 43-yard punt six yards to the Broncos 39-yard line. Denver then drove 48 yards in 10 plays, including a 31-yard burst by running back C. J. Anderson, to score on McManus' 31-yard field goal, making the score 20–12 with 10:02 left on the clock. New England took the ball back and drove to the Broncos 16-yard line. But on 4th-and-1, defensive back Chris Harris tackled Julian Edelman for a 1-yard loss. Following a punt, New England got into the Broncos red zone again, this time driving all the way to the 14-yard line. This drive also ended with a turnover on downs, this time an incomplete pass on 4th-and-6. Following a three-and-out, Edelman returned Colquitt's 52-yard punt 16 yards to midfield with 1:52 left in the game. Brady threw three consecutive incompletions, but on 4th-and-10, he launched a 40-yard bomb to Gronkowski on the Broncos 10-yard line. A few plays later, the Patriots faced 4th-and-goal from the 4-yard line, but Brady proved up to the task again, throwing a 4-yard touchdown pass to Gronkowski that made the score 20–18 with 12 seconds left on the clock. On the subsequent 2-point conversion attempt, Brady took a snap out of shotgun formation and threw a pass to Edelman, but the ball was deflected by Aqib Talib into the arms of defensive back Bradley Roby for an interception. Had New England converted the 2-point conversion, the game would have been sent to overtime for the first time in an AFC Championship in 29 years. New England then lost their last chance of the game when Gostkowski's onside kick attempt was recovered by Denver defensive back Shiloh Keo. Manning, who threw only one touchdown pass at home during the season, finished the game 17 of 32 for 176 yards and two touchdowns, while also rushing for 11 yards. Anderson was the top rusher of the game with 72 yards on 16 carries, and also caught three passes for 18 yards. Miller had five tackles, 2½ sacks, and an interception. Brady finished his NFL record 31st postseason game 27 of 56 for 310 yards and a touchdown, with two interceptions, while also leading the team in rushing with 13 yards. Gronkowski caught eight passes for 144 yards and a score. Linebacker Jamie Collins had eight tackles and two sacks. With this win, Manning became the first quarterback to lead two different teams to the Super Bowl multiple times. Denver won despite being outgained in total yards 336 to 244. With the loss, the Patriots become the 11th consecutive team to surrender the Vince Lombardi Trophy to a new champion (the 2004 Patriots remain the last repeat World Champion). CAR – Graham Gano 45-yard field goal, 9:35. Panthers 3–0. Drive: 8 plays, 39 yards, 3:56. CAR – Ted Ginn, Jr. 22-yard run (Graham Gano kick), 4:31. Panthers 10–0. Drive: 5 plays, 49 yards, 3:16. CAR – Corey Brown 86-yard pass from Cam Newton (Graham Gano kick), 0:49. Panthers 17–0. Drive: 3 plays, 88 yards, 0:59. ARI – David Johnson 1-yard run (Chandler Catanzaro kick), 5:44. Panthers 17–7. Drive: 10 plays, 79 yards, 6:03. CAR – Cam Newton 1-yard run (Graham Gano kick), 1:56. Panthers 24–7. Drive: 5 plays, 46 yards, 2:49. CAR – Graham Gano 21-yard field goal, 7:53. Panthers 27–7. Drive: 11 plays, 80 yards, 7:10. CAR – Cam Newton 12-yard run (Graham Gano kick), Panthers 34–7. Drive: 8 plays, 79 yards, 4:11. ARI – Darren Fells 21-yard pass from Carson Palmer (2-pt conversion – J. J. Nelson run), 14:16. Panthers 34–15. Drive: 10 plays, 80 yards, 2:52. CAR – Devin Funchess 5-yard pass from Cam Newton (2-pt conversion – Cam Newton pass to Mike Tolbert), 5:26. Panthers 42–15. Drive: 9 plays, 84 yards, 6:12. CAR – Luke Kuechly 21-yard interception return (Graham Gano kick), 5:11. Panthers 49–15. Carolina dominated the game from start to finish, outgaining Arizona in total yards 476 to 287 and forcing seven turnovers in the first NFC Championship played at Bank of America Stadium. The Panthers accomplished this despite the loss of all-pro linebacker Thomas Davis and veteran safety Roman Harper, who both suffered game-ending injuries in the first half. On the Panthers first drive, quarterback Cam Newton completed three passes for 32 yards and rushed for four yards on the way to a 45-yard Graham Gano field goal. Arizona had to punt on their next drive, and Ted Ginn Jr. returned it 32 yards to the Cardinals 49-yard line. Several plays later, he took a pitch on an end around play and raced 22 yards to the end zone, giving Carolina a 10–0 lead. At the end of Arizona's next drive, Drew Butler's 43-yard punt pinned the Panthers back at their own 12-yard line. On 3rd-and-8, Newton fired a pass to Corey Brown near the 40-yard line. Brown caught the ball, evaded a tackle attempt by Rashad Johnson, and took off for an 86-yard touchdown reception, making the score 17–0 with 49 seconds left in the first quarter. It was the longest play in Panthers postseason history. Meanwhile, the Cardinals offense continued to struggle, as quarterback Carson Palmer lost a fumble due to a hit by Kawann Short, which linebacker Luke Kuechly recovered on the Panthers 38-yard line. However, this time the Cardinals defense stepped up and forced a punt. Taking the ball back at their 21-yard line, Palmer completed four consecutive passes for 45 yards as the team drove 79 yards in 10 plays to score on David Johnson's 1-yard touchdown run, cutting the deficit to 17–7. Arizona's defense then forced another punt, but in what turned out to be a critical play, returner Patrick Peterson muffed the kick and defensive back Teddy Williams recovered it for Carolina on the Cardinals 46-yard line. Consecutive carries by Jonathan Stewart moved the ball 40 yards to the Arizona 1-yard line. Then on third down, Newton dove over the pile for a 1-yard touchdown that increased the Panthers lead to 24–7 with 1:56 left in the half. What followed was three turnovers over the span of the next four plays. First, Charles Johnson forced a fumble from Palmer that was recovered by safety Tre Boston on the Arizona 31-yard line. Then Newton returned the favor with a pass that was intercepted by Peterson, who returned it 72 yards. He appeared to be heading for the end zone, but Ginn managed to chase him down and tackle him on the Panthers 22-yard line. This turned out to be crucial, as on the next play, Palmer threw a pass that was intercepted in the end zone by safety Kurt Coleman with 49 seconds left until halftime. Carolina took the second half kickoff and drove 80 yards in 11 plays. Newton completed five consecutive passes for 76 yards on the drive, including two to tight end Greg Olsen for 43 total yards and a 14-yarder to fullback Mike Tolbert. Gano finished the drive with a 21-yard field goal that put the team up 27–7. After a punt, Newton completed a 39-yard pass to Ginn and a 17-yard strike to Devin Funchess. Then he finished the possession with consecutive carries, the first for 11 yards, and the second a 12-yard touchdown run that increased their lead to 34–7. Arizona took the ball back and drove for a touchdown, as Palmer completed 7 of 8 passes for 80 yards, the last one a 21-yard scoring pass to tight end Darren Fells. Then J. J. Nelson ran the ball in for a 2-point conversion, cutting the score to 34–15 less than a minute into the fourth quarter. Following a punt, Arizona drove to the Panthers 44-yard line, but their last hope of a comeback slipped away when Palmer threw a pass that was picked off by Coleman for his second interception of the day. After that, Newton completed a 54-yard pass to Olsen, rushed for 14 yards, and finished the drive with a 5-yard touchdown pass to Funchess. Then his 2-point conversion pass to Tolbert put the team up 42–15. After the ensuing kickoff, Kuechly intercepted Palmer's next pass and returned it 22 yards for the final score of the game. While the scoring was over, the turnovers were not, as Palmer was intercepted for the fourth time in the game on the next drive, this time by Boston. Newton completed 19 of 32 passes for 335 yards and two touchdowns, with one interception, while also rushing for 47 yards and two scores. Brown caught four passes for 113 yards and a touchdown, while Olsen had six receptions for 113 yards. Stewart was the leading rusher of the game with 83 yards. Ginn rushed for 22 yards, caught two passes for 52 yards, and added 38 more yards on two punt returns. Coleman had four tackles and two interceptions, while Kuechly had eight tackles, an interception returned for a touchdown, and a fumble recovery. Boston had a fumble recovery and an interception. Meanwhile, Palmer was badly mauled by the Panthers defense, completing just 23 of 40 passes for 235 yards and a touchdown, while being intercepted four times and losing two fumbles. David Johnson was the team's leading rusher and receiver with 60 rushing yards and nine receptions for 68 yards. This was the most lopsided NFC Championship game since the Giants shut out the Vikings 41–0 in the 2000 NFC Championship Game. Carolina's 49 points set a new record for most points in an NFC Championship Game. Denver took the opening kickoff and started out strong. Peyton Manning completed an 18-yard pass to tight end Owen Daniels and a 22-yard throw to receiver Andre Caldwell. A pair of carries by C. J. Anderson moved the ball up 20 yards to the Panthers 14-yard line, but Carolina's defense dug in over the next three plays. First, linebacker Shaq Thompson tackled Ronnie Hillman for a 3-yard loss. Then after an incompletion, Thomas Davis tackled Anderson for a 1-yard gain on third down, forcing Denver to settle for a 3–0 lead on a Brandon McManus 34-yard field goal. The score marked the first time in the entire postseason that Carolina was facing a deficit. After each team punted, Panthers quarterback Cam Newton appeared to complete a 24-yard pass to Jerricho Cotchery, but the call was ruled an incompletion and upheld after a replay challenge. CBS analyst and retired referee Mike Carey stated he disagreed with the call and felt the review clearly showed the pass was complete. Two plays later, on 3rd-and-10 from the 15-yard line, linebacker Von Miller knocked the ball out of Newton's hands while sacking him, and Malik Jackson recovered it in the end zone for a Broncos touchdown, giving the team a 10–0 lead. This was the first fumble return touchdown in a Super Bowl since Super Bowl XXVIII at the end of the 1993 season. After a punt from both teams, Carolina got on track with a 9-play, 73-yard scoring drive. Newton completed all four of his pass attempts for 51 yards and rushed twice for 25 yards, while Jonathan Stewart finished the drive with a 1-yard touchdown run, cutting the score to 10–7 with 11:28 left in the second quarter. Later on, Broncos receiver Jordan Norwood received Brad Nortman's short 28-yard punt surrounded by Panthers players, but none of them attempted to make a tackle, apparently thinking Norwood had called a fair catch. Norwood had not done so, and with no resistance around him, he took off for a Super Bowl record 61-yard return before Mario Addison dragged him down on the Panthers 14-yard line. Despite Denver's excellent field position, they could not get the ball into the end zone, so McManus kicked a 33-yard field goal that increased their lead to 13–7. On Carolina's next possession, fullback Mike Tolbert lost a fumble while being tackled by safety Darian Stewart, which linebacker Danny Trevathan recovered on the Broncos 40-yard line. However, the Panthers soon took the ball back when defensive end Kony Ealy tipped a Manning pass to himself and then intercepted it, returning the ball 19 yards to the Panthers 39-yard line with 1:55 left on the clock. The Panthers could not gain any yards with their possession and had to punt. After a Denver punt, Carolina drove to the Broncos 45-yard line. But with 11 seconds left and no timeouts left, Newton was sacked by DeMarcus Ware causing time for the half to expire. The Panthers seemed primed to score on their opening drive of the second half when Newton completed a 45-yard pass to Ted Ginn Jr. on the Denver 35-yard line on their second offensive play. But the Broncos defense halted the drive on the 26-yard line, and it ended with no points when Graham Gano hit the uprights on a 44-yard field goal attempt. After the miss, Manning completed a pair of passes to Emmanuel Sanders for gains of 25 and 22 yards, setting up McManus' 33-yard field goal that gave the Broncos a 16–7 lead. Carolina got off to another strong start after the kickoff, with Newton completing a 42-yard pass to Corey Brown. But once again they came up empty, this time as a result of a Newton pass that bounced off the hands of Ginn and was intercepted by safety T. J. Ward. Ward fumbled the ball deep in Denver territory during the return, but Trevathan was able to recover the ball enabling Denver to keep possession. There would be no more scoring in the third quarter, but early in the fourth, the Broncos drove to the Panthers 41-yard line. On the next play, Ealy knocked the ball out of Manning's hand as he was winding up for a pass, and then recovered it for Carolina on the 50-yard line. A 16-yard reception by Devin Funchess and a 12-yard run by Stewart then set up Gano's 39-yard field goal, cutting the Panthers deficit to one score at 16–10. The next three drives of the game would end in punts. With 4:51 left in regulation, Carolina got the ball on their own 24-yard line with a chance to mount a game-winning drive, and soon faced 3rd-and-9. On the next play, Miller stripped the ball away from Newton, and after several players dove for it, it took a long bounce backwards and was recovered by Ward, who returned it five yards to the Panthers 4-yard line. Newton was the third player to attempt a recovery (following Demarcus Ware and Mike Remmers) of the ball and while various angles appeared to show that he had a decent probability of recovery if he'd dived in his attempt, Newton instead hesitated and instead tried to drop on top of the ball, which failed. This split second decision later earned him heavy criticism. Meanwhile, Denver's offense was kept out of the end zone for three plays, but a holding penalty on cornerback Josh Norman gave the Broncos a new set of downs. Then Anderson scored on a 2-yard touchdown run and Manning completed a pass to Bennie Fowler for a 2-point conversion, giving Denver a 24–10 lead with 3:08 left and essentially putting the game away. Carolina had two more drives and managed just one first down between them before the game ended. ↑ Rosenthal, Gregg (June 4, 2014). "NFL won't use Roman numerals for Super Bowl 50". NFL.com. NFL Enterprises, LLC. Retrieved November 30, 2015. 1 2 Rovell, Darren (June 4, 2014). "NFL: It's Super Bowl 50, not L". ESPN.com. ESPN Internet Ventures. Retrieved December 31, 2015. ↑ Coelho, Ana Livia (May 11, 2015). "NFL Wild Card Playoff Game Will Return to ESPN – and Be Simulcast for the First Time on ABC". ESPN MediaZone (Press release). Retrieved August 24, 2015. ↑ Boren, Cindy (May 12, 2015). "Early Lead NFL wild-card game will be simulcast by ESPN on ABC". The Washington Post. Nash Holdings, LLC. Retrieved December 31, 2015. ↑ Dragon, Tyler (January 3, 2016). "NFL playoff schedule released". National Football League. Retrieved January 4, 2016. ↑ Wesseling, Chris. "Steelers narrowly escape Cincinnati with win". NFL.com. NFL Enterprises, LLC. Retrieved January 10, 2016. 1 2 Freeman, Mike (January 10, 2016). "Disgraceful Bengals Loss in Ugly Playoff Could Cost Coach Marvin Lewis His Job". bleacherreport.com. Cincinnati: Bleacher Report, Inc. Retrieved January 10, 2016. ↑ Patra, Kevin. "Big Ben returns to lead Steelers to comeback win". NFL.com. NFL Enterprises, LLC. Retrieved January 10, 2016. ↑ Silver, Michael. "Could Meltdown at Paul Brown spell the end for Marvin Lewis?". NFL.com. NFL Enterprises, LLC. Retrieved January 11, 2016. ↑ Wesselling, Chris (January 11, 2016). "Vontaze Burfict suspended three games, will appeal". NFL.com. NFL Enterprises, LLC. Retrieved January 12, 2016. ↑ "Joey Porter, Mike Munchak, Adam Jones fined for actions during wild-card game". Sports Illustrated. Time Inc. January 15, 2016. Retrieved January 17, 2016. ↑ "Vikings, Seahawks play 3rd coldest game in NFL history". KARE-11. Minneapolis: Gannett Satellite Information Network, Inc. Associated Press. January 10, 2016. Retrieved January 10, 2016. ↑ "Seahawks survive, advance after hooked FG". ESPN News Services. Minneapolis: ESPN Internet Ventures. Associated Press. January 10, 2016. Retrieved January 10, 2016. ↑ "After slow start, Rodgers, Packers overwhelm Redskins 35–18". ESPN News Services. Landover, Maryland: ESPN Internet Ventures. Associated Press. January 10, 2016. Retrieved January 10, 2016. ↑ Czarda, Stephen (January 10, 2016). "Jordan Reed's Dominance Carries Over To Playoffs". Redskins.com. Retrieved January 11, 2016. ↑ Golen, Jimmy (January 16, 2016). "Patriots to 5th straight AFC title game, beat Chiefs 27–20". Associated Press. Foxborough, Massachusetts: AP Sports. Associated Press. Retrieved January 17, 2016. ↑ Teicher, Adam (January 16, 2016). "Andy Reid offers little explanation for Chiefs' clock woes vs. Patriots". ESPN.com. Foxborough, Massachusetts: ESPN Internet Ventures. Retrieved January 17, 2016. ↑ Hanzus, Dan (January 16, 2016). "Gronkowski strikes twice as Patriots outlast Chiefs". NFL.com. NFL Enterprises, LLC. Retrieved January 17, 2016. ↑ Pelissero, Tom (January 17, 2016). "Cardinals get wild OT win over Packers to reach NFC title game". USA Today. Glendale, Arizona: Gannett Satellite Information Network, Inc. Retrieved January 17, 2016. ↑ Marshall, John (January 17, 2016). "Cardinals knock off Packers 26–20 in NFC playoffs". Associated Press. Glendale, Arizona: AP Sports. Associated Press. Retrieved January 17, 2016. ↑ Seifert, Kevin; Wilde, Jason (January 17, 2016). "Coin toss, catch controversy heighten drama of Cardinals' win". ESPN.com. Glendale, Arizona: ESPN Internet Ventures. Retrieved January 17, 2016. ↑ Baum, Bob (January 17, 2016). "Cardinals' "Hail Larry" trumps Rodgers' Hail Mary". Associated Press. Glendale, Arizona: Yahoo! Sports. Associated Press. Retrieved January 17, 2016. ↑ Orr, Conor (January 16, 2016). "Cardinals survive Packers' Hail Mary in wild OT win". NFL.com. NFL Enterprises, LLC. Retrieved January 17, 2016. ↑ Rosenthal, Seth (January 16, 2016). "Here's the Arizona Republic's 'HAIL LARRY' cover for the Cardinals' amazing overtime win". sbnation.com. Vox Media. Retrieved January 18, 2016. ↑ Wilner, Barry (January 17, 2016). "Panthers build 31-0 lead, hold on to beat Seahawks 31-24". Associated Press. Charlotte, North Carolina: AP Sports. Associated Press. Retrieved January 18, 2016. ↑ Newton, David (January 17, 2016). "Panthers take control of the NFC from Seattle, advance to NFC title game". ESPN.com. Charlotte, North Carolina: ESPN Internet Ventures. Retrieved January 18, 2016. ↑ Brinson, Will (January 17, 2016). "Panthers overcome 'tight butts' to beat Seahawks: 11 things to know". CBSSports.com. Charlotte, North Carolina: CBS Interactive. Retrieved January 18, 2016. ↑ "Panthers build 31-0 lead, hold on to beat Seahawks 31-24". USA Today. Charlotte, North Carolina: Gannett Satellite Information Network, Inc. Associated Press. January 17, 2016. Retrieved January 18, 2016. ↑ Shpigel, Ben (January 17, 2016). "Peyton Manning, the Broncos' Flickering Star, Glows Just in Time". The New York Times. Denver: The New York Times Company. Retrieved January 22, 2016. ↑ Sessler, Marc (January 17, 2016). "Big Ben: We wouldn't be here if it wasn't for Toussaint". NFL.com. NFL Enterprises, LLC. Retrieved January 18, 2016. ↑ "Peyton Manning engineers late TD drive to lift Broncos into AFC finale". ESPN News Services. Denver: ESPN Internet Ventures. Associated Press. January 17, 2016. Retrieved January 22, 2016. ↑ Pells, Eddie (January 18, 2016). "Manning, Broncos rock on after 23-16 win over Steelers". Associated Press. Denver: AP Sports. Associated Press. Retrieved January 18, 2016. ↑ "Broncos battle past Steelers to set up Brady-Manning XVII". The Guardian. Denver: Guardian Media Group. Associated Press. January 17, 2016. Retrieved January 22, 2016. ↑ Graham, Pat (January 24, 2016). "Brady, Patriots fall 20-18 to Broncos in AFC title game". Associated Press. Denver: AP Sports. Associated Press. Retrieved January 25, 2016. ↑ Reiss, Mike; Seifert, Kevin (January 24, 2016). "Stephen Gostkowski's broken extra point streak proves costly". ESPN.com. Denver: ESPN Internet Ventures. Retrieved January 25, 2016. ↑ Jones, Lindsay (January 24, 2016). "Broncos go all out to finish off Patriots on final stop". USA Today. Denver: Gannett Satellite Information Network, Inc. Retrieved January 25, 2016. ↑ "Broncos defense stymies Patriots, Peyton Manning heads to fourth Super Bowl". FoxSports.com. Denver: Fox Sports Interactive Media, LLC. Associated Press. January 24, 2016. Retrieved January 25, 2016. ↑ Wesseling, Chris (January 24, 2016). "Broncos smother Patriots, advance to Super Bowl 50". nfl.com. NFL Enterprises, LLC. Retrieved January 25, 2016. ↑ Wilner, Barry (January 24, 2016). "Newton, Panthers rout Cardinals, 49-15 for NFC title". Associated Press. Charlotte, North Carolina: AP Sports. Associated Press. Retrieved January 25, 2016. ↑ Somers, Kent (January 24, 2016). "Cardinals stars fail to shine in NFC title game loss". USA Today. Charlotte, North Carolina: Gannett Satellite Information Network, Inc. Retrieved January 25, 2016. ↑ Seifert, Kevin (February 7, 2016). "NFL's catch rule makes early Super Bowl 50 appearance". ESPN. Retrieved February 8, 2016. ↑ Dubin, Jared (February 7, 2016). "Jordan Norwood runs for longest punt return in Super Bowl history". CBSSports.com. Retrieved February 8, 2016. ↑ Sherman, Rodger (February 7, 2016). "Cam Newton fumbled and didn't try to jump on it in the biggest play of the Super Bowl". SBNation.com. Retrieved February 8, 2016.